Randolph College has announced that Associate Dean of the College Paula Wallace will serve as the 2018 Commencement speaker. 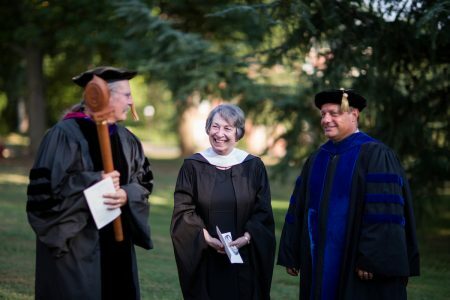 The ceremony will honor about 160 graduates and will take place in the Dell on Sunday, May 13, at 10 a.m.
Beloved by generations of students and graduates, Wallace is the longest-serving member of the Randolph College staff. She is retiring at the conclusion of the academic year, after 45 years of service to the College. Wallace received her B.A. in French from William Jewell College in Missouri and her M.A. in Romance Languages from the University of North Carolina, Chapel Hill. She was hired at the College in 1973, as a temporary French professor and resident director for Wright Hall. After a few years of teaching, she took on the role of associate dean of the College, with a primary responsibility of overseeing the College’s academic advising program.